Dog Flea Life Cycle: How to Break it! Simply killing the fleas on your dog isn't enough. By understanding the flea life cycle you'll be able to stay one jump ahead! Learn everything you need to break the life cycle of fleas and banish those bloodsucking parasites for good! Getting rid of the fleas on your dog isn't just about killing off the adult fleas. 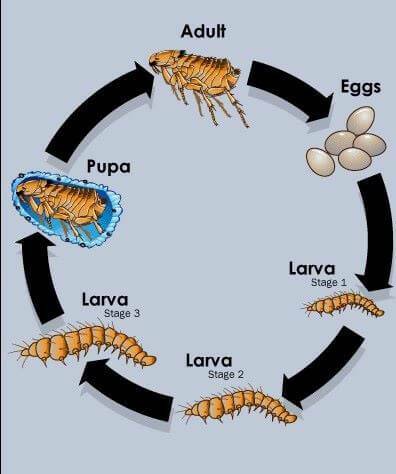 You also have to stop the development of existing eggs, larvae and pupae, otherwise they'll continue to develop into adult fleas and begin the cycle all over again! By understanding the flea life cycle and its habitat, you'll be taking the first step to getting rid of your dog's fleas for good! The flea life cycle consists of four distinct stages: adult, eggs, larva, and pupa. Adult fleas feed on blood from your dog. They'll also feed on you if they get the opportunity. They're really not fussy whose blood they drink! Once fleas settle on a host, they will feed, mate, and then lay eggs. The adult female flea can lay between 30 and 50 eggs a day, and up to 200 in her lifetime (and that's just one flea!). Doesn't bear thinking about, does it? Adults account for only 5% of the flea population. What this means is that the other 95% are somewhere in the flea life cycle, on their way to becoming fully grown fleas ready to begin mating again! Adult fleas can live up to 100 days; however, they don't normally live for much longer than 10 days on your dog. This is probably because many will die and drop off your pet after the dog has been treated for fleas or he'll remove them as they bite him (that's what he's doing when he's nipping and nibbling at his fur). New adults (those that haven't yet fed on blood) feed on flea droppings, dead skin and fungus, and they can live up to two years without feeding on blood. The good news is that they cannot produce eggs until after their first blood meal. However, after they've had their first taste of blood they must feed every few hours. So, adult fleas are more likely to be found on your dog (it's their feeding ground!) and immature fleas are more likely to be found in your Cocker Spaniel's bedding or around the home and in your carpets. Flea eggs are oval, slightly opalescent and about the size of a grain of sand. They don't need to live on your dog in order to survive. The adult flea may lay her eggs in your Cocker's coat, but because flea eggs are dry and loose, they can (and often do) fall very easily onto carpets, bedding, furniture, grass; in fact, your dog can lead a trail of flea eggs wherever he goes! The eggs can survive most conditions and can endure severe changes in temperature, even to the point of drying out. Depending upon the temperature and humidity, they usually hatch between two days and two weeks. However, they may lie dormant for up to two years and as soon as conditions are just right they will begin to develop. Just when you think you've won the war against fleas, back they come! The larva breaks through the soft egg 'shell' using a hard spike on the top of it's head known as a chitin tooth. The flea will lose this cutting tooth during the moulting process as it matures. Flea larvae are around 2-3 mm long and look similar to maggots. They are blind and don't like the light. They prefer humid conditions, which is why they're more likely to be found in dark, sheltered places such as cracks, crevices, under furniture or in among your dog's bedding. They feed on dried blood from the droppings of adult fleas, hair, dead skin, and other organic matter found deep in the pile of your carpets or in your dog's bed. Larvae moult through three stages, or instars, lasting from 5 days to several months depending upon conditions and grow larger between each moulting stage. When the third and final stage is complete, they spin a silken cocoon. Pet hair, carpet fibres, dust, etc. stick to this silken covering and form a protective camouflage. When conditions are just right, they pupate. The pupa is the final stage where the larval form changes to an adult flea inside the cocoon. Although the pupal stage lasts between a week and ten days, the flea may remain in the cocoon, protected against the elements and predators, just waiting for the right conditions before emerging. Such conditions would be warmth, humidity, vibration, or carbon dioxide - signs that a food source and accommodation, ie animals or humans, are nearby. And so the process begins again; the fleas find a suitable host, they feed, mate, and the female lays her eggs. Flea Life Cycle: The Movie! You've read the book, now watch the movie! For those that prefer visuals, I thought I would add this short video showing the life cycle of dog fleas. I hope you enjoy watching it. Now that you understand more about the dog flea's life cycle it's easy to see that killing the adult fleas alone won't necessarily get rid of an infestation. It's a good start, but you've also got to get rid of the eggs, larvae and pupae, otherwise the fleas will return. Because temperature and humidity have a big impact on how long the eggs take to progress to adult fleas, it means that in summer their life cycle can come full circle within a couple of weeks. When the weather is cooler however, it can take up to 2 years for the fleas to progress from eggs to adults. This is why it's essential to be on the look out for evidence of dog fleas (for example eggs or dried blood) so that you can begin to treat your Cocker Spaniel immediately. If you think your Cocker has fleas, click on the photo below to learn how to get rid of them. Getting rid of a flea infestation on your dog and in your home can take a long time, especially if you didn't notice early enough that your dog had fleas! If you'd like to learn how to get rid of fleas on your dog (and in your home) click on this little bloodsucker to your right. Learn how to get rid of dog fleas - permanently!